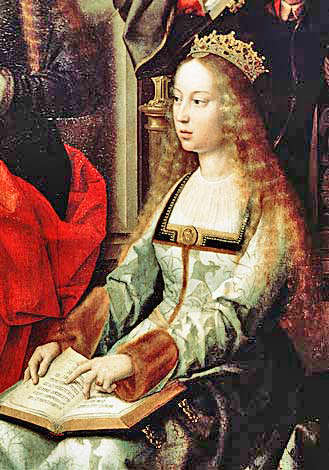 The queen of Castile died on November 24th, 1504. After 50 days of anxious prayers and processions, Queen Isabella of Castile called a halt to all further intercession. She knew she was finished and she resolutely prepared herself for death. When an attempt to assassinate her husband Ferdinand almost succeeded in 1492, she had written that since ‘kings can die of some disaster like other people, there is reason to prepare to die well.’ Bedridden at her palace at Medina del Campo in her last months, suffering from a high fever and worsening dropsy, by the middle of September she was unable to cope with state papers and tormented by sleeplessness and thirst. On October 12th she signed her will, a long document in which she declared that her mind was ‘healthy and free’, though her body had ‘an infirmity that God wished to give me.’ She begged the Virgin Mary, St Michael and the saints to intercede for her at the judgement, that through divine mercy her soul might ‘be placed in that glory for which it was created.’ She feared the vengeance of the Devil for his minions – Muslims, Jews, heretics – to whom she had given no quarter all her life. She charged her successors to honour God, protect and defend Holy Mother Church, proceed with the conquest of Africa from the infidels, keep a firm hold on the Straits of Gibraltar and support the Holy Inquisition in the fight against ‘the depraved heretic’. A codicil added on November 23rd asked for the Indians in the New World to be kindly treated. She did not want to die with them on her conscience. At the end the Queen said that prayer and the reading of biblical texts, especially from Job, had given her a clearer understanding of God than she had ever felt before. She died on a Tuesday morning, between eleven and twelve o’clock, after receiving the last rites. Isabella was 53. She had been queen of Castile for thirty years since 1474 and joint ruler of Castile and Aragon with her husband Ferdinand for 25. Her body was put in a plain coffin covered with leather and tied with cords, and carried behind a cross draped in black cloth across country through torrents of rain and over rivers in flood to reach Granada at last on December 18th. There she was interred in the Franciscan monastery in the Alhambra and there Ferdinand would duly join her after his death in 1516. It was a suitable place. The marriage of Ferdinand and Isabella, Los Reyos Catolicos (the Catholic Sovereigns), in 1469, had been a long step towards the conquest of the Muslim kingdom of Granada, the expulsion of the Moors and the creation of a united Christian Spain which would become the most powerful country in Europe. Although no one ever questioned the sincerity of Isabella’s religious convictions, a merciless Catholic ideology was a useful way of promoting political unity and a common purpose against a common foe. So were Isabella’s fair hair, blue eyes, expensive dresses and jewellery, and her constant travelling made her a ruler an unusual number of her subjects could recognise. Ferdinand and Isabella’s drive to conquer the Moorish kingdom of Granada began in 1481. In 1483 they reorganised the Inquisition under royal control, with Isabella’s confessor Thomas de Torquemada at its head. Heresy became the same thing as treason and the Inquisition eagerly sniffed out ‘secret Jews’, who had allegedly faked conversion to Christianity. When Granada finally surrendered in 1492, the promises of religious toleration which had been made were broken and when Isabella showed misgivings about this, Torquemada held a cross out to her with the words, ‘Judas sold his master for thirty pieces of silver. How many will you take for this cross?’. Jews and Muslims were ordered to convert to Christianity or leave. Some 20,000 Jewish families emigrated, many of them to settle in Istanbul. Many Muslims also left, for North Africa. Others, the Moriscos, accepted Christianity, or appeared to. Converted Jews and Muslims were deeply suspect and a witch-hunt began to smell out those who were not genuine. Thousands were convicted by the Inquisition and the fires burned for them across Spain.